Ray Rose H869 -X Moonglow with an Ultra Flexible Sole. Ray Rose Moonglow H869-X with Ultra Flexible Sole is a High Tech upgrade to the popular Moonglow 869 Model. 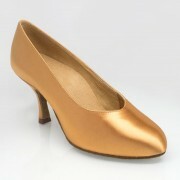 Moonglow is a beautiful shoe very popular with Duo Dance customers. Moonglow comes in Light Tan Satin and a Medium Width. A range of heel heights are available. The Dark Tan version is listed separately. The new Ultra Flex insole makes this one of the most luxurious dance shoes on the market and is one of our most popular competition shoes. In addition to being ultra flexible it also features a high supportive arch. Revolutionary design, the front of which combines a beautiful “platted” central section with six straps which give full support to the toes. Rounded back & square toe shape. High supportive arch (suitable for medium and high arches). Light Tan Satin in medium fitting. 2″ slim heels, 2.5″ and 3″ flared, 3.2″ stiletto and 3″straight.